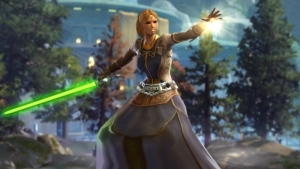 Join Jason, Mox and Ravanel as they share their experiences in SWTOR. This week they are joined by CRR’s home theorycrafter Conrad. We discuss the latest news about the gearing system of 5.1 and Bioware’s handling of the Fractured exploit. Finally, we dive into an in-depth discussion of class balance with Conrad, the state of the sorc class in particular. Character transfers are back to the normal rate. We discuss our thoughts on boss drops for 5.1. Will be fixed on the 24th with 5.1, no action taken against participants. Everyone briefly shares their thoughts. Inventory Full: I Say! That’s Not Cricket! CXP Fun fact: if you’ve already done the Shae Vizla encounter and still have the holocommunicator, you can consume it and get 20 CXP. It also works for Master Ranos and Niko. 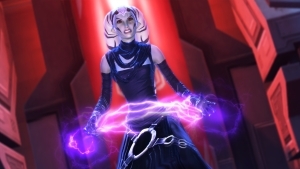 Note that if you unlock Shae Vizla before KotFE, you will lose her until after chapter 14. This is intended. Today’s show we gave away another 30-day sub code and 450 Cartel Coins. Be sure to join us live for your chance to win! A big thanks to Kid Lee and Larry Everett for the hosts on Twitch. Corellian Run Radio is still looking for writers, assistants to help moderate live stream chat and other areas to help our podcast continue to grow. Stay tuned! Let us know if we are missing any podcasts! Contact us through our website (corellianrun.com), Twitter @Corellianrun (Jason: @JT_HoloNet, Mox: @FtWorthJim & Rav: @Rav_Griffon), Facebook page or Facebook group. Episode 176: Time to go Commando Episode 178: Super Changes?